Franken Cash is the right slot for those who like it rough and scary. No need to say that the creation was inspired by the dark Frankenstein story. Despite the horror theme, the slot does not intend to scary you to death, but rather to tick your nerves before presenting with a good sum of money. Franken Cash thrills you with horror music and graphics, but attracts with beneficial options. 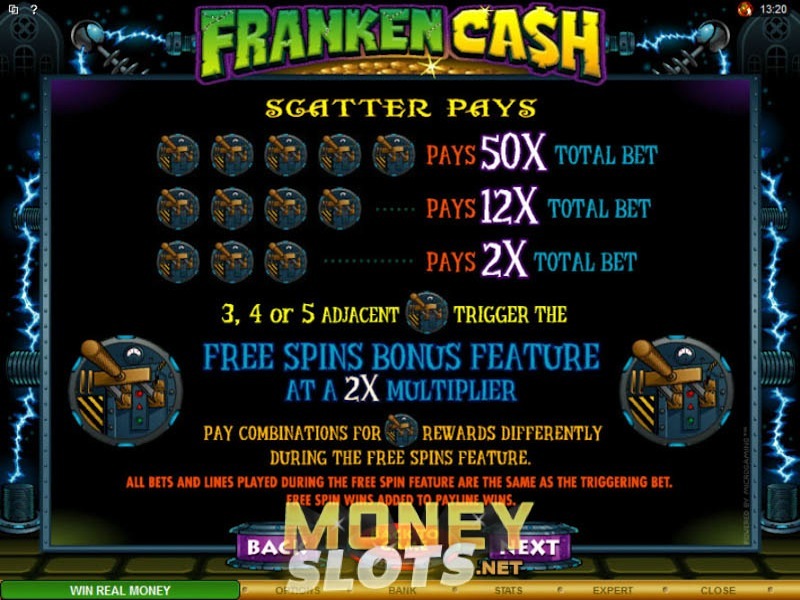 Franken Cash is available for download at many online casinos. As soon as you click the “Download” button, your meeting with the horrible begins. The technicalities are these: Franken Cash features five reels. The symbols are linked to Hallowe’en and an old black-and-white movie about Frankenstein’s monster. The slot has 20 paylines and a variety of bonus games and free spins. The Franken Cash logo functions as the wild symbol of the game. Its frequent occurences mean that you stand a living chance of getting a prize. If you find two or more Frankenstein symbols on any reels, the bonus game is activated. The Lever acts as a scatter symbol, activating payout multipliers and free spins. 5 levers increase your bet by 50! Franken Cash has a liking for brave ones. For those of you who are not afraid of monsters headed by a crazy scientist, Franken Cash is the ultimate playing experience!